An avid swimmer who often takes to the water with her family, Fergie is a 14-year-old Black Lab who was saved by Miami Fire Rescue when severe separation anxiety caused her to take matters into her own paws and go in search of her people. 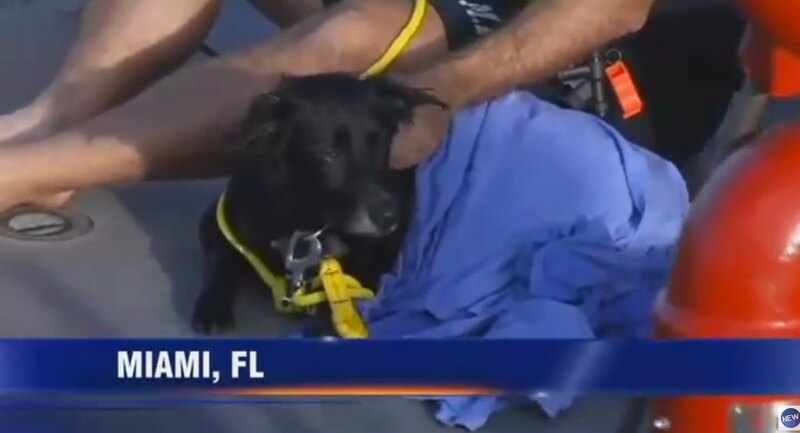 Looking for her pet parents, the elderly dog took to the water near her home in Coral Gables, Florida and dog-paddled her way for an astonishing nine miles to Biscayne Bay, triggering calls to 911 when people spotted her struggling in the water. Two good Samaritans attempted to rescue the exhausted animal, and their signals alerted the Miami Fire Rescue team who were already on their way. The tired swimmers were also picked up and taken back to shore as part of the rescue. Once Fergie spotted the rescue boat she changed direction and swam toward it. Hauled aboard, the tired dog was given a blanket to help her warm up and snuggled against one of her rescuers as the boat made its way to the bayside dock and a happy reunion. Her owners say that they didn’t realize Fergie could get out of the house, nor did they anticipate that the two hour separation would distress the old dog to the point where she would make this kind of attempt to find them. The delighted dog showed her joy when reunited with her favorite people back on shore, and perhaps there was a little pride as well…she found them!